We are excited and proud to present two programs for friends with PD, funded by community grants from the Parkinson’s Foundation. The Parkinson’s Movement Initiative (PMI), a program founded in 2017 by American Dance Festival (ADF), NC Dance for Parkinson’s and Poe Wellness Solutions, provides regular movement opportunities serving the Triangle PD community. PMI began as an extension of NC Dance for Parkinson’s and Poe Wellness Solutions’ Pilates for Parkinson’s, and has since formed a fruitful collaboration that continues to serve the PD community and their caregivers in the program’s second year. With support from the Parkinson’s Foundation, all programming offered through the PMI is free to individuals living with PD and their care partners. 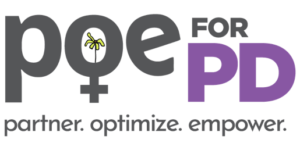 POE Women for PD provides 3-6 months of Integrative Health & Wellness Coaching (IHWC) to women with Parkinson’s Disease. IHWC brings value to the client’s treatment plan through one-on-one support, inquiry and accountability outside of the clinic, day-to-day, where living occurs. The client receives a partner in learning to become the expert of her life, health and choices. Poe Wellness Solutions partners with the client to define optimal health and together we generate empowerment for success.